With the cold slowly creeping up on us, there’s really nothing better than the thought of hot chocolates, fires, onesies, snuggles and a cute new knitting project to keep you busy and warm. 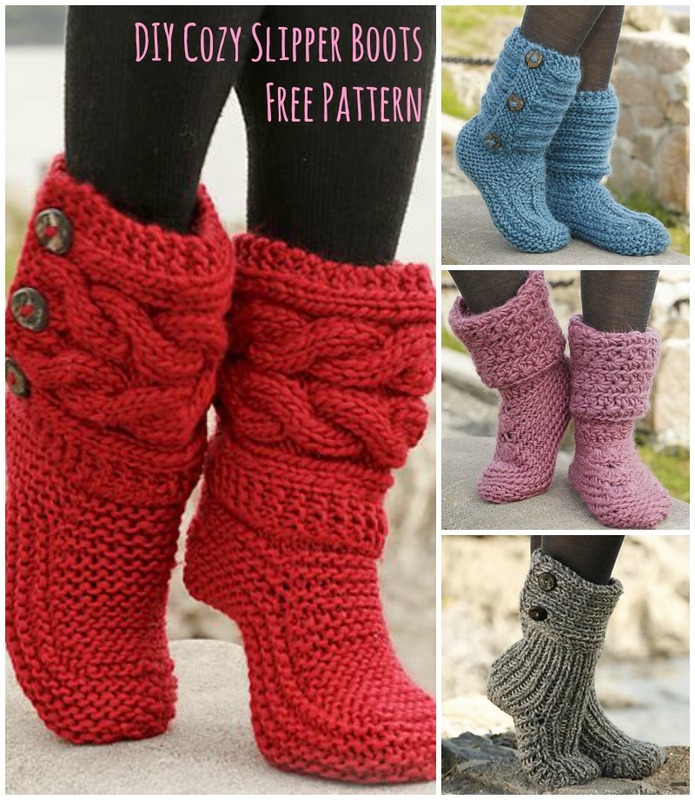 We managed to find this free pattern for our newest obsession: slipper boots! These amazingly cozy-looking boots are like the love-child of socks and slippers that look like they’ll give your feet (and ankles) a big ol’ comforting hug! The pattern doesn’t look too difficult to get through: you start from the top and work your way down to the foot, and you can even add some buttons or other embellishments if you’re feeling particularly creative. Just keep in mind that the measurements are in centimeters and millimeters, so you’ll have to convert those if you’re used to inches. The pattern is free for you to use over and over again, just visit these links Pink, Red, Grey, Blue and print them NOW! 🙂 The site lists yarn for sale (The pattern is FREE), but you may get lucky if you’ve got your own lying around from a previous project. Otherwise you can order the yarn online or simply go out and buy it yourself (the site also offers some alternative yarns that will work with the pattern). Are you as in love as we are? Send us your pics of your slipper boots once you’re done! If you missed the link just click here: Moon Socks by DROPS Design (Grey Boots), Little Red Riding Slippers By DROPS Design (Red Boots), One Step Ahead by DROPS Design (Blue Boots) and print the patterns! The pink boots are crocheted you can find the pattern here: Sweet Spirited by Drops Design (Pink Boots). Each pattern is linked after the boots pics. Very nice of you to give us free patters to knit or crochet the cold days away! 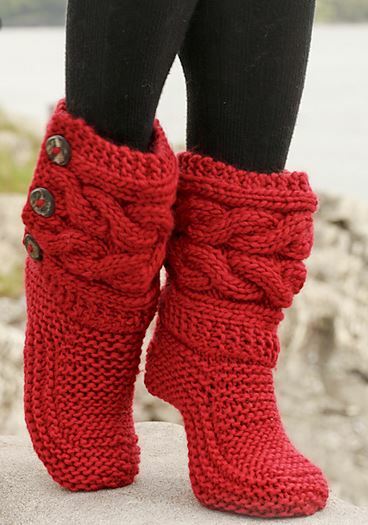 I really love the red boots but would be nice to have the pattern in crochet form. Under each photo you see a link pointing to garnstudio.com there you can get the printable pattern. I work with women offerders. Many have life senteces. They will be so gratefull for these patterns. Thank you! Bonjour, comment avoir des explications en français ?… tout est joli, on ne peut que désirer….. I made a couple pairs of the cable pattern slippers. They are so cute – turned out really well. I have requests to make more…. just not enough time. How do I get the pattern for the red slipper socks? https://www.garnstudio.com/pattern.php?id=6198&cid=17 here you’ll find the pattern.